Not a lot. This book features John Walker as Captain America and was towards the beginning of Mark Gruenwald’s 10-year run on the title. After Steve Rogers resigns, not wanting to be a government pawn,(sound familiar?) John Walker takes over as Captain America and these books follow his struggle to live up to his predecessor. I believe this book has the new Cap taking on the Freedom Force, as the cover says from the pages of The X-Men, I recall it being quite the blood bath. Let’s see how it holds up. Re-Collection Price:$1.25 (for a debatable Very Good condition. 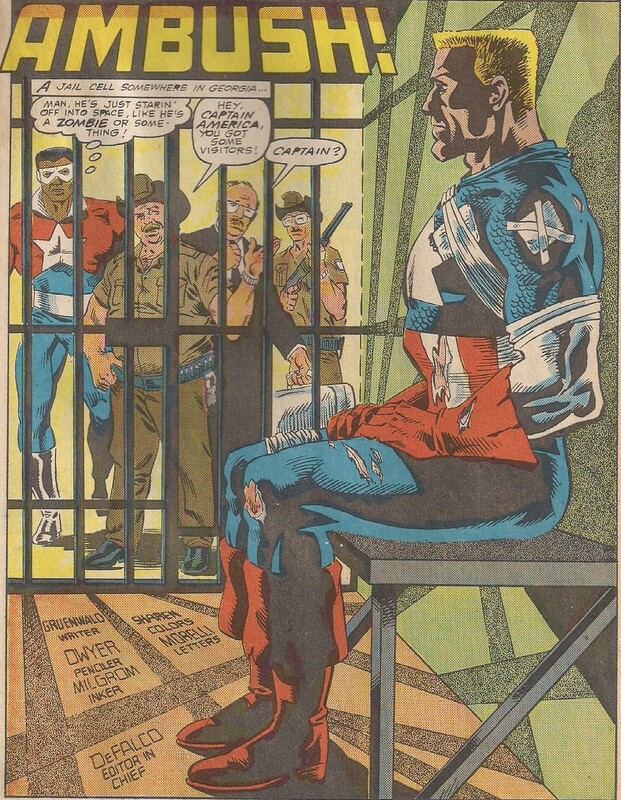 We begin with Captain America sitting in a jail cell, nursing battle wounds. Battlestar, his sidekick, and a representative from the Commission on Superhuman Activities are there to bail him out. Captain America, in a fit of rage, massacred the Watchdogs, the terrorist group that murdered his parents. The committee now has to decide whether to fire Walker or keep him on as Cap and cover the incident up. Meanwhile a rebel mutant group, the Resistants, is about to free another anti-registration mutant as he are transported to the Vault. The Vault was a precursor to the Raft prison from today’s comics and the Marvel Cinematic Universe. A rag-tag group if I do say so myself, porcupine guy? Battlestar is reassigned to the Freedom Force, a group of mutants that are capturing those resisting the Registration Act. While Battlestar gets acquainted with his new team Walker is getting chewed out and relieved of his shield until the decision is reversed by a mysterious higher-up, who is bathed in red light. As though her team thought that Mystique's power was being blue. How does one read the word balloon out loud, "Question Mark?" When the rebels take the bait the run into Captain America: Mutant Smasher! He rips through the team like a man possessed until Battlestar gets him under control. In the final panel we learn that Walker missed his parents funeral for this mission. Yes, John Walker was a replacement hero and it’s interesting to see how he struggles s compared to the original. He’s a rageaholic and a government pawn, something Rogers would never be. It’s also interesting to see the government sponsored Captain America siding with registration, something that 20 years later the original Captain America is famously not in favor of. It’s also is interesting to see how the idea of hero registration has been played around with in different forms before the stories that we all know. I’m really interested in collecting more of Gruenwald’s lengthy run, which I think is largely forgotten due to it ending during the Onslaught fiasco, amid low sales. It’s a shame that Gruenwald died so young I would love to see what contributions he would make in the past 20 years to the Marvel Universe and even the movies. One of my favorite covers in my collection. We stay in the late 1980’s but jump over to DC where Batman tracks a dumpster killer in Batman #414! See you next week! Same as last week. Anyone ever have a Candilicious?